With its vast beaches, historic sites, the innumerable fish restaurants of its modern hotels and motels and its cafes and bars, Alanya, is an outstanding holiday getaway. The first thing that greets the visitor is the 13th century Seljuk Castle,which sits like a crown on top of the Alanya Peninsula. 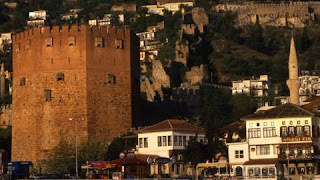 Besides the impressive castle, there is the shipyard and the Red Tower (Kizil Kule) with monumental beauty. All along the road which runs beside the port are latenight cafes and bars and boutiques selling handicrafts, leather clothing, jewelry, handbags and local gourds painted with extraordinary colors. 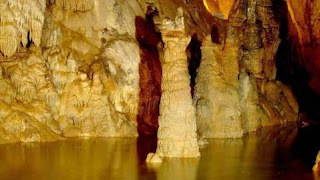 If you like to explore caves, then you must see Damlatas Cave. Near the cave is the Ethnography Museum. 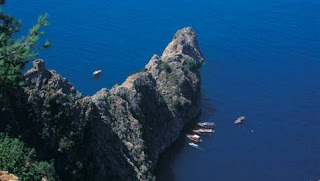 By boat you can reach three other caves: the Phosphorous Cave with its phosphoric rocks, Girls Cave (Kizlar Cave), where pirates held their women prisoners, and Lovers Cave (Asiklar Cave). The cool shade of Dim Brook Valley, 15 km east of Alanya, is an ideal place to get away and relax. The sea all around Alanya is excellent for swimming. Alanya is a paradise of sun, sea and sand. 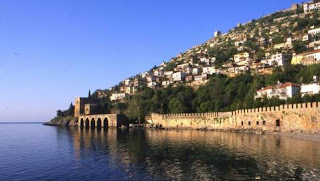 Based on skeletal evidence found between the villages of Bademagaci and Oba northeast of the city, Alanya is believed to have been inhabited in pre-historic times.Alanya was sometimes considered part of Cilicia and sometimes part of Pamphilia. It was later ruled by the Hittites and Romans respectively. In a bad state of repair after a number of invasions and wars, the city was rebuilt by the Romans. 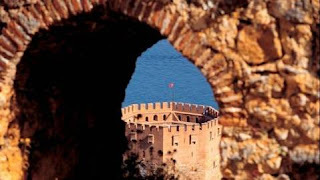 In the Byzantine era, Alanya was called Kolonoros, which means the 'beautiful mountain'. Because of its climate, plants from all over the world can be found in Alanya. Some of the most common are oranges, bananas, vegetables of all kinds, tropical fruits from South Africa and India such as papaya, guava, avocado and a variety of dates and coffees. 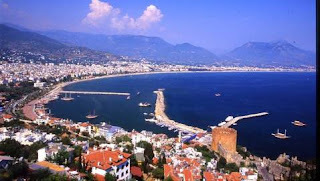 Alanya has a typical Mediterranean climate with wet humid winters and hot dry summers. The average temperature year-round is 19ºC. 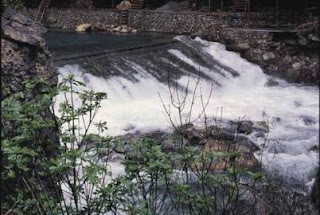 The water averages 21ºC. 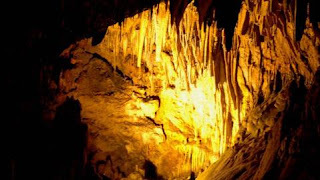 Dim Cavern is located within the bounderies of Alanya - Kestel township, towards the south slope of Dim valley, at an altitude of 232 m.
The Cavern is 134 km from Antalya Airport and its distance from Alanya city centre is 11 km. You may gain access to the cavern, by taking the seaside road passing through Kestel township. 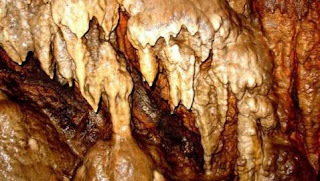 Dim Cavern was known for a long time and some parts were used as a sheep fold. During 1986 the cavern was studied geologically and geomorphologically. The Cavern was introduced to the visitors after the conclusion of scientific inspections by MAGTUR Co. in 1998. 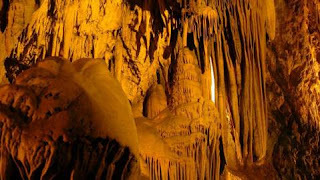 This cavern had been named as "Dim Cavern" due to the name of the population living nearby. 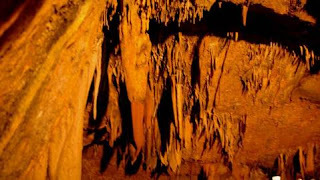 The 360 m long path is prepared and illuminated, so as to provide a pleasant excursion offering a tremendous scenary of stalagmites and stalactites to the visitors. You can observe the continious formation and the calcerous flowers in Pamukkale Hall at the west side of Dim Cavern; as well as the lake located at the southern part. The environment will offer you all seasons at the same time of year with the snowy peaks of the Taurus Mountains, the clean and warm sea, and the bright sun of the Mediterranean region.